While I know full well that we could have been camping with our kiddos when they were younger, it just didn't happen (except the one time when #1 was 3 months old) but now we're excited to be at a point where everyone enjoys a weekend away. This summer, we've taken one gnarly trip as a family on Father's Day, hubs and #1 took a backpacking trip, and then I took the boys camping for a couple of nights last week. I realized through these trips that we're not super organized when we camp and I know we could have more fun playing and spend less time digging for things if we had it all planned out. I also like the idea that if we're well organized, we can go camping at a moment's notice without spending hours preparing, assembling, and packing. Knowing we needed a system, I took to the internet. I took what I'd learned from our experiences and found solutions I thought would fit our camping style as well as consider how we can store stuff when we're home and where it has to fit in the car. I created a whole system from lists of what to do before we leave to what to pack and where. For starters, we now have a binder. I think binders solve most organization problems. I love them ... possibly a little too much. 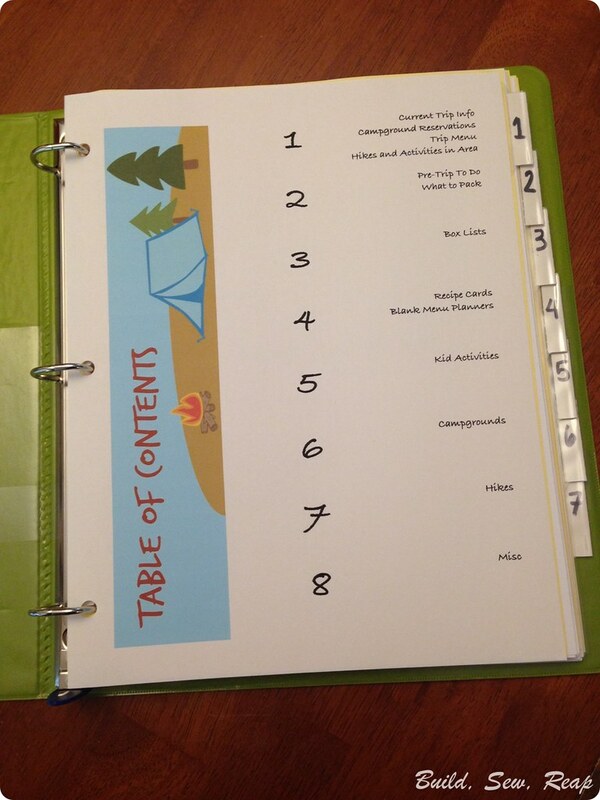 You might be wondering what's in my binder, well, here's the table of contents. Section 1 contains the current trip info which would likely be campsite reservations or if we're going back-country camping, it would be a map of the area. 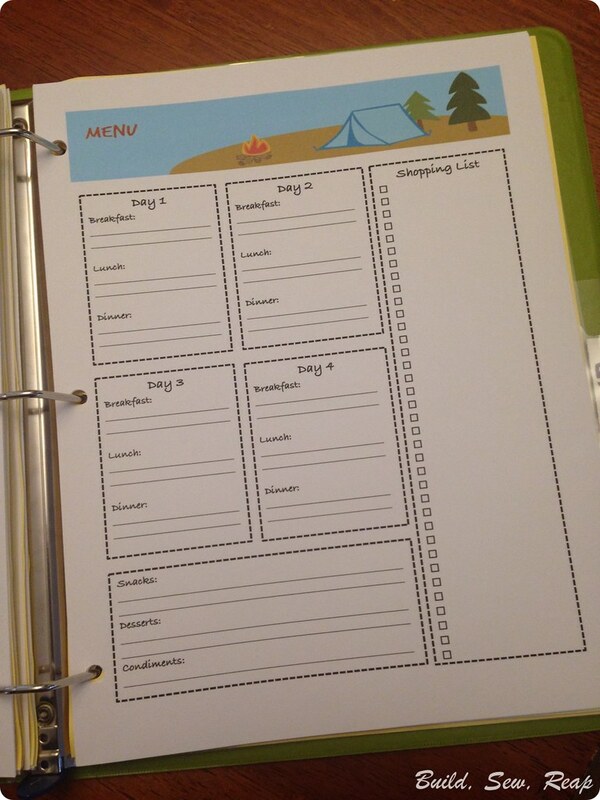 This is where the trip menu will also reside once it is filled out. Finally, I like to print out information about area hikes when we camp so those will be here too. 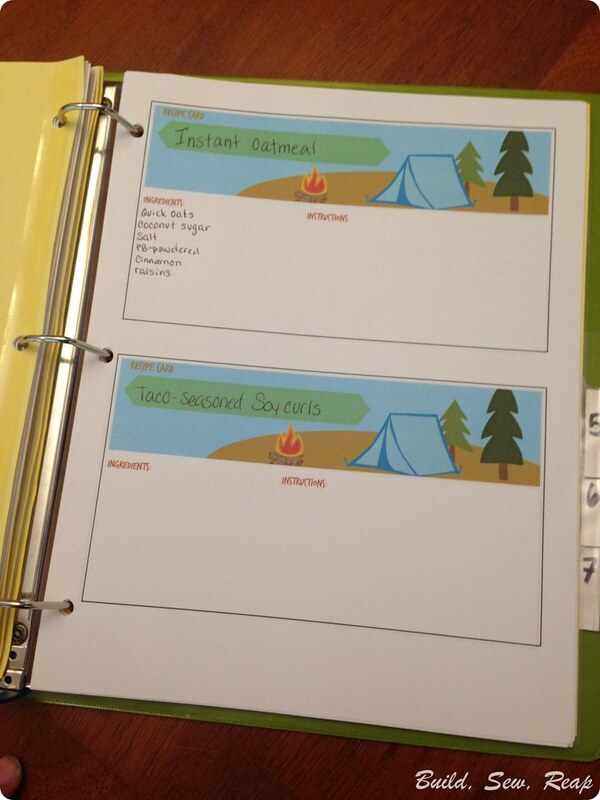 After a trip, the campsite printouts will move to section 6 and the hike printouts will move to section 7 along with any notes we've made. In section 2, I keep some lists of stuff to do and stuff to pack. There are about 20 things I need to make sure to do in the days or hours before any trip including charging devices, arranging care for the cats and chickens, planning the menu, etc. I have all this on one list and then the next list is what needs to be stuffed into the trunk of my Mazda 3. 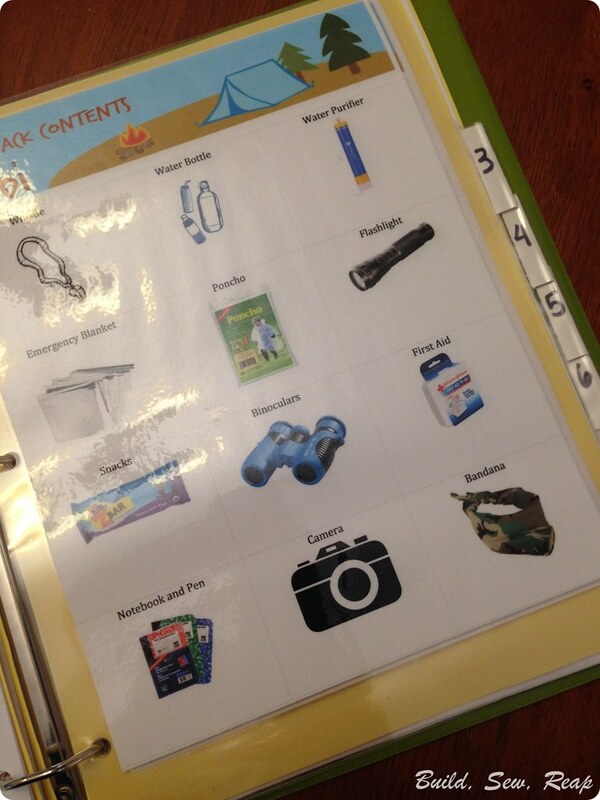 In this same section, I have laminated pages for each of the boys so they know what should always be in their day-hike bags. I make sure each child is equipped to spend a night in the woods no matter what. Yes, it would be a miserable night but it would be a night alive if they have the items I listed on their pages. I haven't yet allowed either to have access to fire or matches without me but as the 8 year old prove he can be trusted, he will eventually carry a fire kit. 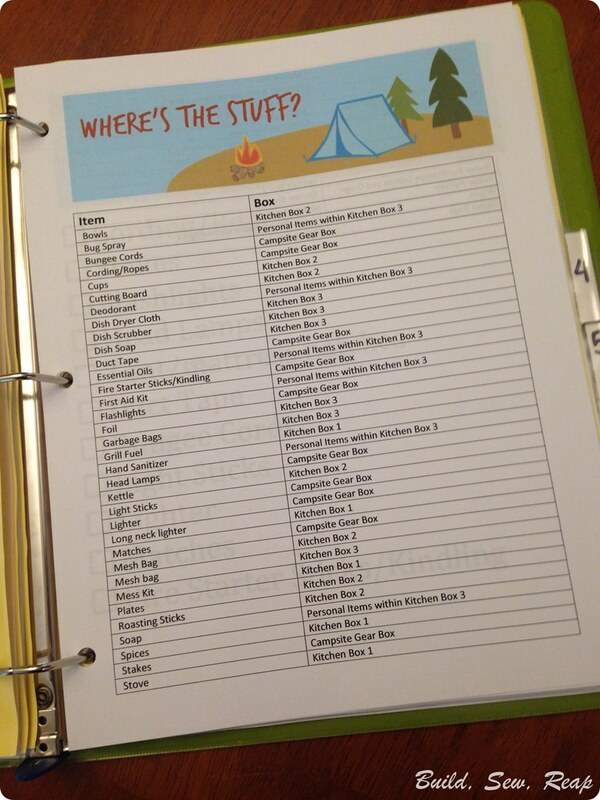 Following the master packing list are lists of what should always be within each of the camping boxes (campsite gear, kitchen box 1, 2, 3). My goal is to make sure those remain packed at all times. When we get home from a trip, I'll make sure they are set to go for the next trip before they go back on the shelf in the garage. Each box contains a list taped to the outside but then I also created a master list in alphabetical order which will stay in the binder. 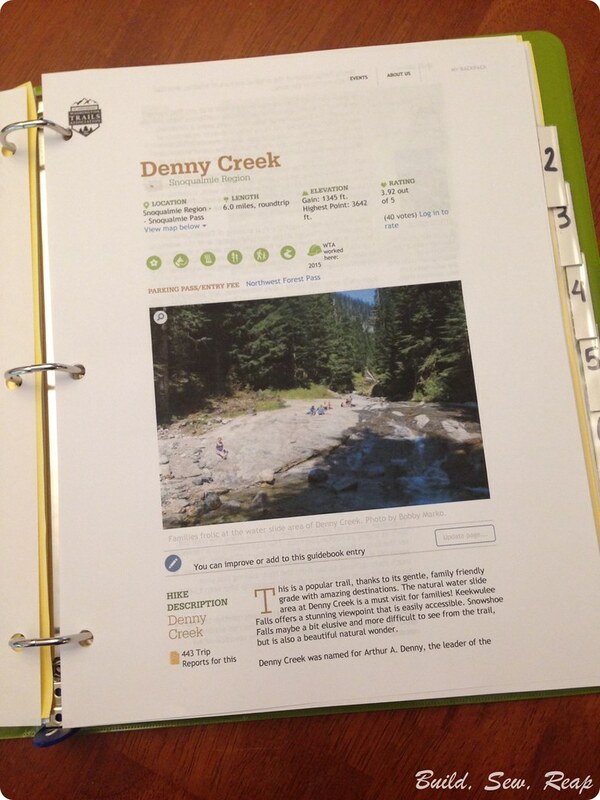 This takes us to section 4 with recipe cards and the master menu for each trip. I already talked about sections 6 and 7 which will contain the print outs from past campsite reservations and hikes we've taken so I won't revisit those. I'm not sure what will go in section 8 yet so I guess it doesn't matter that the tab is missing. I've mentioned the use of boxes several times now. I found some terrific water-tight boxes made by Ziploc that were exactly what I needed. I wanted shallow boxes so we wouldn't have to keep pawing through to find things. I also wanted tight fighting lids that wouldn't let in moisture or spiders. These stack nicely and are very sturdy. 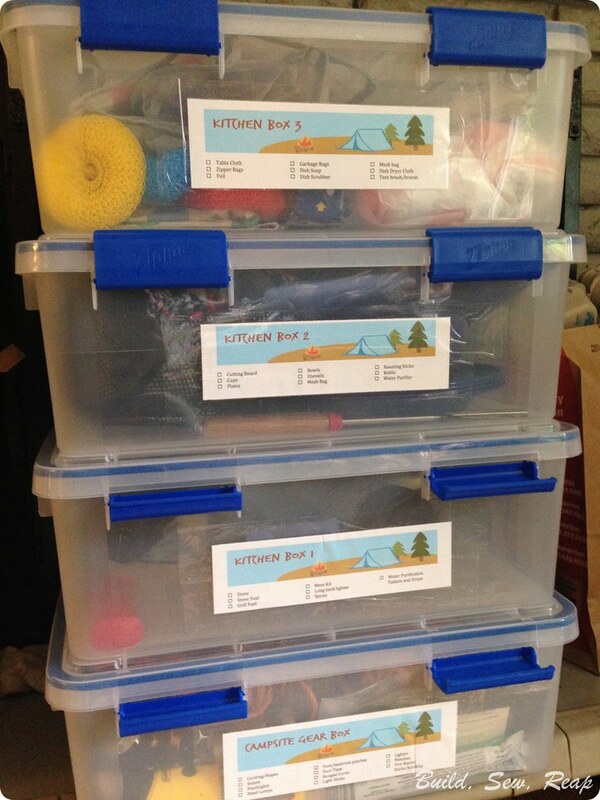 I organized all our supplies into the boxes and taped contents lists to the front. 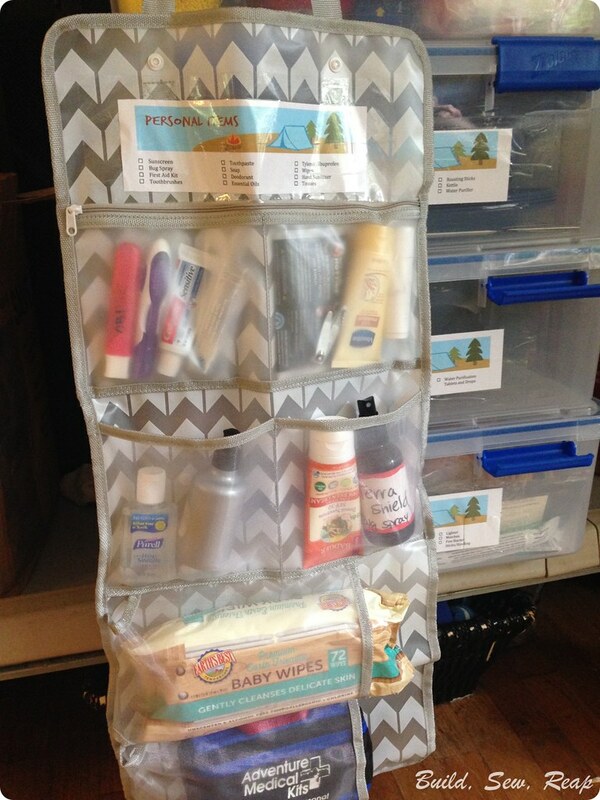 Finally, I loaded our personal items into a roll-up shower caddy. This can hang from a tree in our campsite during the day and easily roll up to be stored in the tent at night (no bear risk) or in the car (bear risk). I'm sure our systems will change a bit as we camp more but I feel like we're off to a strong start. Does your family go camping? Do you like car-camping (in a campground, feet from your car) or do you like to head deep into the woods with all your stuff on your back? 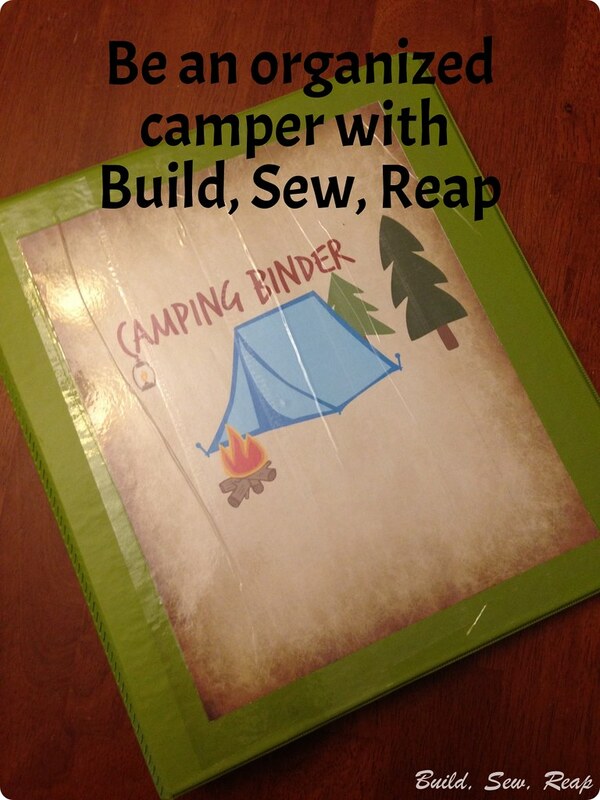 Do you have any great tips to share with me as a novice family camper? I've always spent a lot of time in the woods and did some car camping as well as backpacking in college but am just getting my feet wet with family camping. It's a whole different beast so I welcome any suggestions you might have. As it is familiar to me, all these boxes and stickers. Clutter of things, and sorting what you need and what you can throw out for ever. Now I have a spacious house, and from my old house I took everything to the last crumb. The transportation of my things was organized with the help of this https://www.moveprola.com/burbank-movers/ company. I do not even know how I could move with all of it alone. A satellite phone or split devices that allow you both to text or call friends, and send an emergency signal to a call center that then routes your location to the nearest emergency service provider. For hygiene and cleaning, Jameson recommends baby wipes and a small bottle of liquid soap -- The Camping Companion is great all-purpose soap. 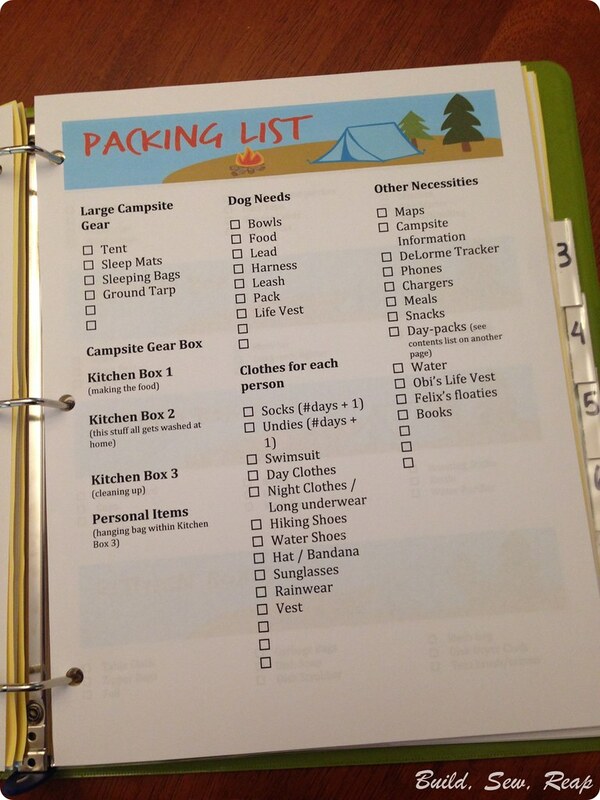 Wow, I love to be that organised when going camping. I don't think it's possible for me to be that organised though. I truly get pleasure from while I read your blogs and its content. Too many campers go to the age-old solution of fast food, it's what's for dinner. This is because they don't always know where to turn to for easy Camping Meals for Kids..